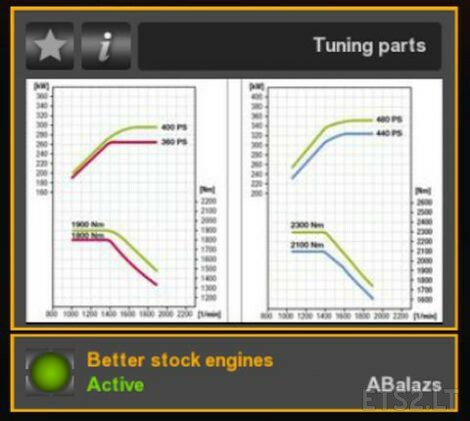 The mod adds realistic torque curves to all stock engines. All figures in the engine’s description – torque, power, rev ranges – are now represented correctly in game. I used publicly available factory data to build torque characteristics for each engine. Some engines becomes markedly different with the mod, the Iveco Cursor 8 for example can revved to 2500/min now, and pushes its peak torque at higher revolutions. I tested the mod with 1.25, but it could work with 1.24 as well, and all future versions supporting the same engine description files. Before 1.24 the game didn’t support torque curves, so don’t even try to use it with earlier versions. As I know, the mod does not generate any errors, but if you find any, please report. Excellent report for the volvo fh2012, as my truck. Very realistic bravo, better reaction in drive during acceleration with a trailer. I wonder how these will affect my ai, if I introduce these variables to them? Does it work on the RJL Scania?